I like to cook. Not a lot, nothing too fancy, nothing too complicated or difficult to make (usually). But I do enjoy cooking! It’s a fun activity and a great de-stressor for me when I have the time and the ingredients. I’m a vegetarian, so my meal options can be somewhat limited (I’m pretty picky about tofu and veggie burgers, and I don’t like eggs). So I love trying out new meat-free concoctions in an effort to add new foods to my list. But cooking takes a long time. Usually I’m not willing to wait very long to eat… once I’m hungry, I’m hungry! So most of the foods I make tend to be relatively speedy to put together. 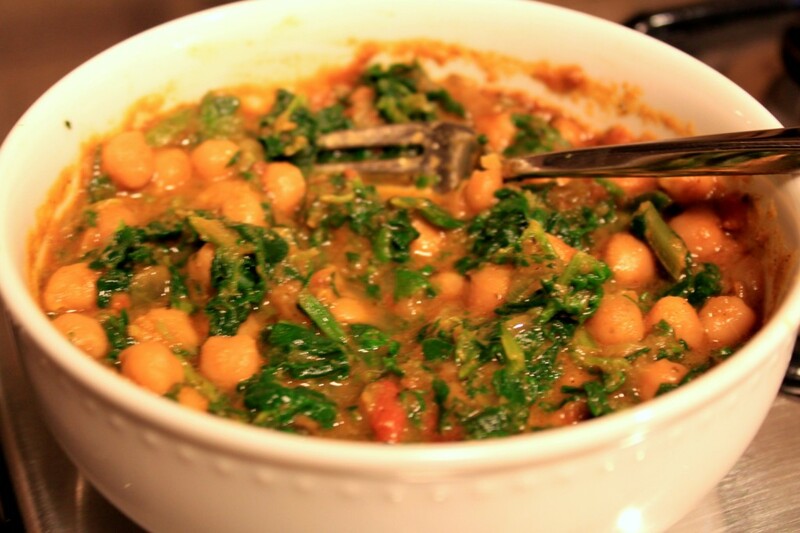 ( 1) Channa and Saag Curry: Sounds fancy, but it’s actually just a mix of various frozen food items from Trader Joe’s! Take one package of frozen Channa Masala (i.e. garbanzo beans and spices), microwave, add 1 cup chopped frozen spinach, and microwave it some more. Then eat it, with toasted Naan bread and a cup of Greek yogurt on the side if you like. Easy peasy, and not to mention delicious! This recipe comes from one of my favorite food blogs, The Picky Eater. It’s an all-vegetarian blog about making healthier versions of the standard dishes we all love. Take a look! 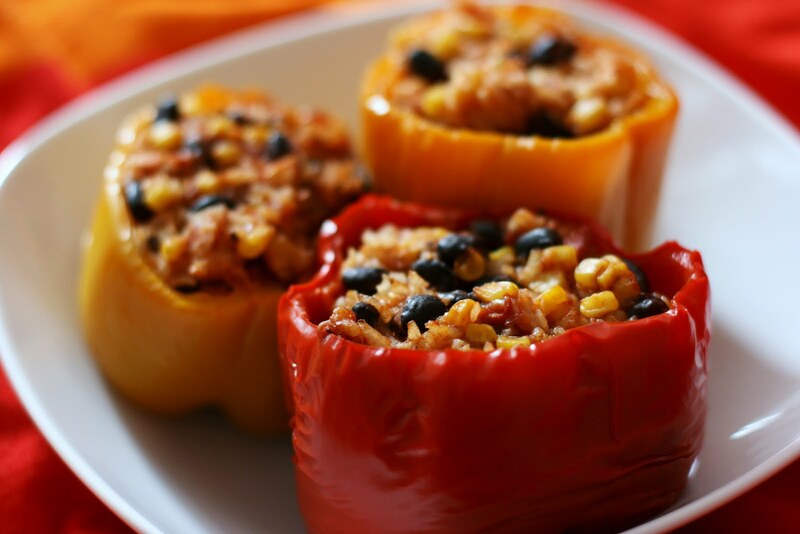 (2) Stuffed Bell Peppers: I’d wanted to try these for a while, but never had the chance. Last year I found a really basic, vegetarian-friendly recipe and gave it a shot… now I love them! The basic idea: mix beans, rice, and spices; spoon into bell pepper with a little bit of cheese; bake or microwave; and top with warm tomato sauce. Yum! You can even get a little bit creative: add in corn, chopped tomato, onion, or other veggies. And, of course, they can be made with meat if you want. The above recipe comes from Allrecipes.com, which, if you didn’t guess, has recipes for just about anything you need. 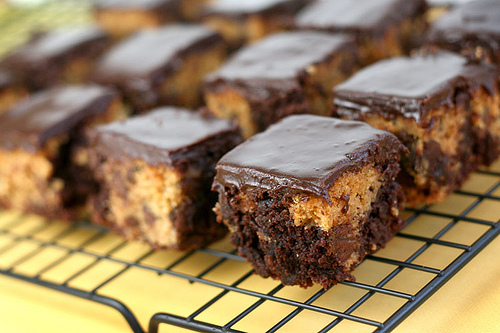 (3) Cookie Dough Brownies with Chocolate Ganache: Okay, so this is a dessert, not a meal. But it’s a consistent winner! I’ve made it for special occasions and just for kicks, and every time, it’s praised and beloved. The best part is that they’re easy to make — just stick boxed brownie mix and cookie dough in a pan, bake it, and top it with chocolate ganache (this is simple to make; she gives you the recipe). Be aware– these brownies are quite decadent, so I’d recommend feeding them to a crowd, or you’ll eat the whole pan! This recipe comes from a site called Bakerella. The name is self-explanatory; this woman is magical with any baked good! I’ve made several of her recipes.